Following this morning’s debut of a deleted scene from the Marvel Studios film, a gag reel from Iron Man 3 has now come online. Check it out in the player below, courtesy of Yahoo! Movies. The launch of “Phase Two” of the Marvel Cinematic Universe pits brash-but-brilliant industrialist Tony Stark/Iron Man against an enemy whose reach knows no bounds. When Stark finds his personal world destroyed at his enemy’s hands, he embarks on a harrowing quest to find those responsible. This journey, at every turn, will test his mettle. With his back against the wall, Stark is left to survive by his own devices, relying on his ingenuity and instincts to protect those closest to him. As he fights his way back, Stark discovers the answer to the question that has secretly haunted him: does the man make the suit or does the suit make the man? 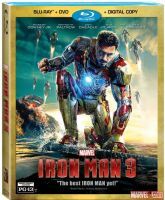 Starring Robert Downey Jr., Gwyneth Paltrow, Ben Kingsley Don Cheadle, Guy Pearce, Rebecca Hall, Stephanie Szostak, James Badge Dale, Jon Favreau, Ben Kingsley and Wang Xuequi, Iron Man 3 will be released digitally on September 3rd and will hit DVD and Blu-ray September 24th. For a full list of special features and additional material that will be found on the Blu-ray, click here.